One of the big selling points of One Piece World Seeker is that players will have a brand new island to explore. Now Bandai Namco has detailed several of the new locations in the latest issue of V-Jump. It shows off several parts of the island that players will get to explore later this year. Saloon – Where the pirates and other ruffians like to gather. Might be a good spot to gather information? Mines – Here you can find beautiful dungeons filled with adventure and treasure in equal parts! Broadcasting Tower – These towers give off broadcasts but they are unusually large. Downtown – To think you can even run around an environment like this!? And look, Nami is here too! Valley – With lush greens as far as the eye can see, the valley is a great spot to take in the sights. Fortress – This looks like an exact copy of Impel Down, the great prison! It’s a completely modern looking facility with machines all over! What in the world is going on here? Did you like what you saw in the screenshots? 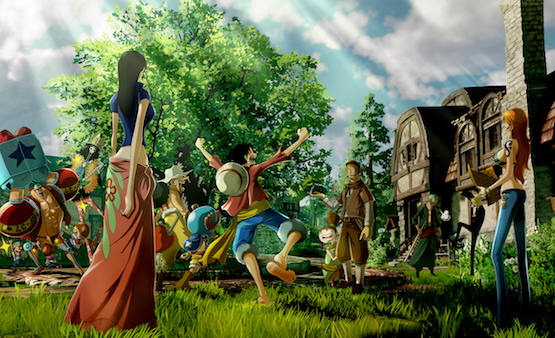 Let us know if you’re excited about the latest confirmed One Piece World Seeker locations, and the promise of a new island to explore, in the comments below!